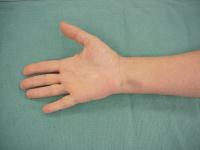 Volar wrist synovitis most often takes the form of a volar wrist ganglion, which may resolve on its own. 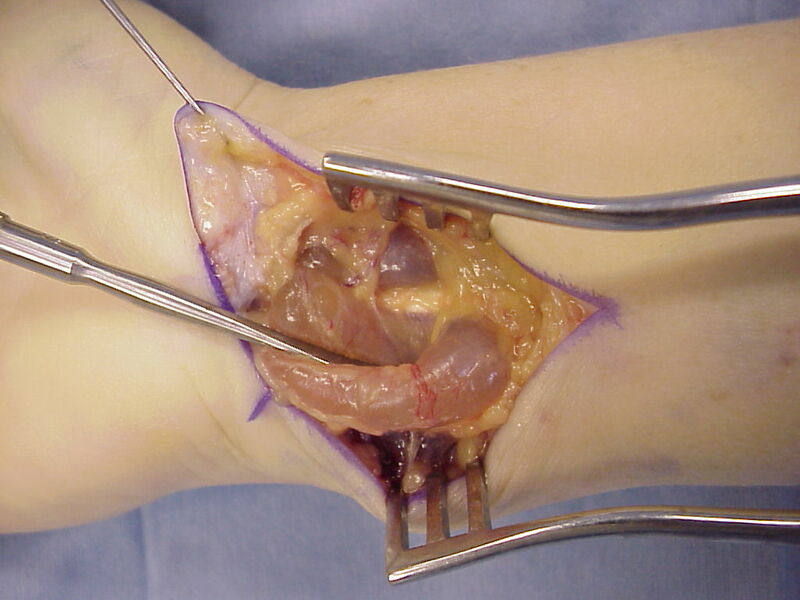 This patient presented with a progressively enlarging soft tissue mass of the distal anterior forearm, two years after an unremarkable open carpal tunnel release through a palmar incision. The mass was soft, an transilluminated freely, suggestive of a volar wrist ganglion in an atypical location. The wrist mass was most prominent in the ulnar distal forearm. At initial exploration, the mass appeared to be a single cyst, resembling a volar wrist ganglion. It had a "pantaloon" shape, bulging around both sides of the flexor tendons. The surface was unusually vascular for a simple wrist ganglion. As the mass was dissected further, it was found to arise from a thick solid layer of inflammatory tissue which involved the deep flexors and pronator quadratus. Flexor tendons were placed under traction to allow a distal synovectomy without having to fully reopen the carpal tunnel. Pathology was interpreted as nonspecific acute and chronic inflammation, and all cultures (bacteria, fungus, mycobacteria) were negative. Rheumatologic evaluation was negative, and there has been no recurrence over a two year followup. The etiology remains obscure.